Yummy Diet Food wishes you a Happy 4th of July! Independence day is a great time to relax, hang out with friends and family, and of course to eat at a bbq or two! I thought this would be a good time to share a few smart & yummy tips with you, so you can eat well at all the bbqs and other parties that you will encounter. 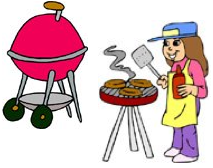 Yummy Tip #1: If you are worried about the food at the bbq, feel free to bring your own, and ask your friends to cook it for you (or cook it yourself). I've been known to regularly bring my own boca burger or boca spicy chicken patties to people's bbqs. That way, they don't have to go to trouble for me (since I don't like meat), and I get to eat something that I love without having to worry about the calories, etc.. In addition to bringing your own "meat" or "fake-meat" (like me), you can also bring a healthy fruit salad, or tossed salad, your own bottled water, or your favorite baked potato chips. Having your own food makes smart eating at a bbq much easier! Yummy Tip #2: Skip the non-hummus dip! Most dips are loaded with ingredients that aren't good for you. The calories in hummus are less than in most dips, although should still be eaten in moderation. Yummy Tip #3: Don't eat a bunch of unhealthy food, just because it is there. If you still feel hungry, grab a drink or some fresh fruit or veggies. Also, you might want to try bringing a few mints with you -- they may help you calm your appetite. Yummy Tip #4: Have fun, and don't worry about it *too* much. Even if you make a few good choices, that is better than if you didn't. If you do end up splurging, make sure you make a careful note of how you feel afterwards, because that "not-so-good" feeling might be enough to keep you from eating a similar item at the next party.